Staging a home calls for big strokes, whether we’re talking furniture, window treatments, accessories, or art. Big Art makes a house look more modern, more luxurious, more comfortable, more valuable. And, It doesn't take up any floor space. But any kind of large-scale work of art is bound to have a price tag to match. DIY is the most practical solution, but not the whole answer. You still have to use your ingenuity. Combine three identically framed pieces each with a third of one large picture. You can use this same format to hang three similar posters, such as three images of Paris or three black and white photos of trees. Look around. You probably already own over-scaled stuff. Use a flat surface like a white board or cork board, as a base instead of reinventing the wheel. 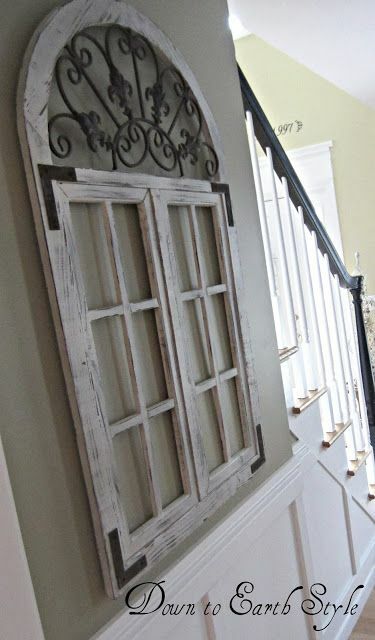 You might be able to convert a vinyl shutter or a window frame into a piece of art, either covered with fabric or paper, or "as itself" pure and simple. Sometimes the frame isn’t the problem, but filling it with art is. 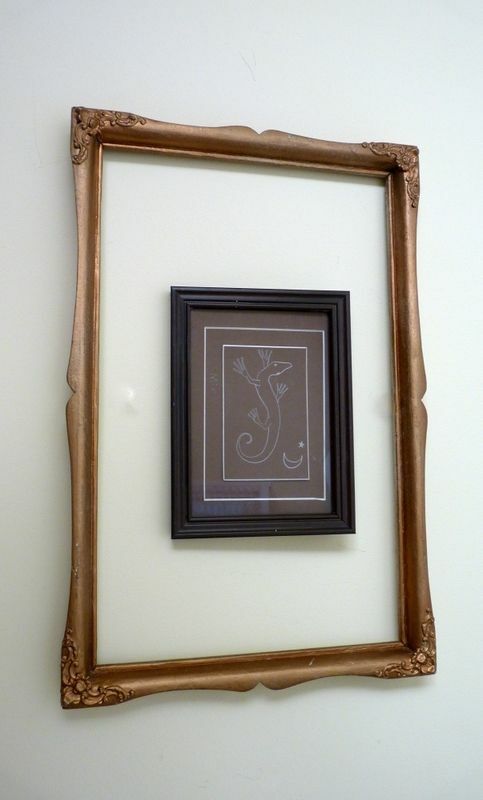 When this happens, you can put a large empty frame around a framed smaller piece. I love this technique when I have art that's great for home staging in every way but size. So, don't pack up all your favorite small paintings! Because of its size, the pencil drawing above would be too insignificant for staging. 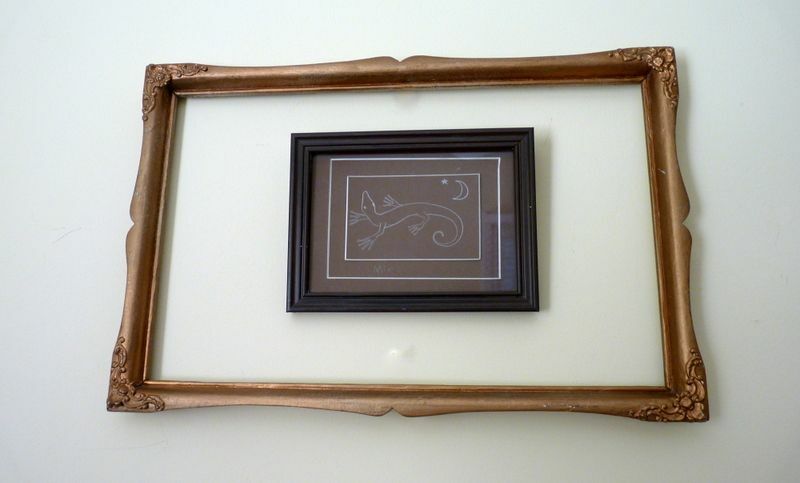 But when I added an ornate frame, it gets the boost it needs. Many decorators don't know that you can get huge sheets of foamcore for budget prices at places like Lowes and Home Depot. Just buy a piece of 1-inch thick rigid insulation at your home improvement store. They cost less than $20 and measure 4 by 8 feet. Cut it in half and you have two, lightweight, 4-foot by 4-foot surfaces that you can wrap with fabric. I've done this and it works. I've also done this and it didn't work when I wrapped it with canvas and then painted the canvas. The board developed a slight warp. Advice: If you want to paint a canvas for your insulation board, do the painting and then wrap the insulation board with it. Wrap like a package, duct tape the fabric on the back, and hang with Command strips. No need for a frame. 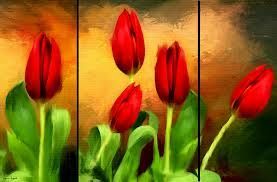 painting of red tulips by Lourry Legarde available through FineArtAmerica. Hang items that weren’t designed to be wall hangings – rugs, quilts, flags, signs. They can be framed under glass, pasted into jumbo combinations, or hung as a gallery wall. As long as there is an aesthetic similarity -- the color, the style, the subject -- your collection will read as one Big Art. awkward area. Photo from blogger Down to EarthStyle. 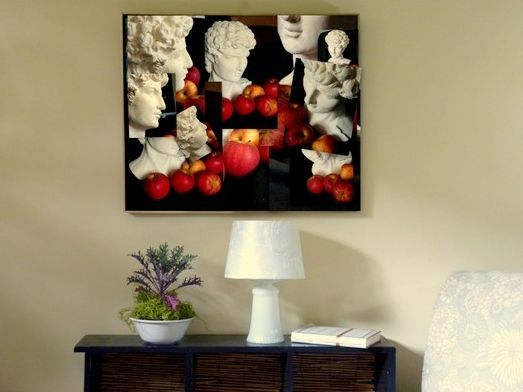 Cut up a print or poster, and reassemble the pieces on a large canvas, cubist style. Or you can create your own crazy cubist picture using your camera and photo editing to make a collage. Start with one subject and photograph it from different angles. I think a big "painting" in the style of cubism would bring any ho-hum space to life. Your camera is your friend here. Photograph the same scene from different angles and then create a collage with photo editing and over-scaled printing at a copy shop. Or print multiples of your pictures and cut and paste them to a canvas. Bingo! I hope you have some fun creating Big Art for your home, whether you are staging it for sale or just dressing up your digs. You can pick up more fun tips in my décor eBooks aimed at professional home stagers and homeowners prepping their own homes for market.